Researchers tinkering with the brains of mice because they can't find anything interesting on Netflix have found a bizarre form of organic switch, one that uses laser light and chemicals to trigger neurons and activities in the brain. The switches aren't there normally, mind, so you can't go turning a mouse rogue by pointing a laser pen at it. These switches were unlocked through genetic engineering, which allowed two sets of brain circuits - one controlling chasing prey and another for killing it - to be activated by either a drug or a light. Author of the paper Ivan de Araujo explained the horror he has unleashed with: "We’d turn the laser on and they’d jump on an object, hold it with their paws and intensively bite it as if they were trying to capture and kill it," presumably opening the door for genetically engineered super soldiers who activate when the sun comes up. 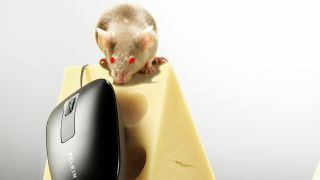 The brain controls work separately too, so if you just want the mouse to chase something only the chasing switch in the animal's amygdala needs to be activated, and if you just want something to be killed because you're above the law and no one will be able to trace the mouse back to you, activate the killer part of the brain. The weird thing is how it turned the mice into indiscriminate hunters. Even inanimate objects fell under attack when the aggression part of the brain was stimulated, although there was still something there in the back of their minds that stopped them from turning on each other. The way hungry mice responded more vigorously suggests it's tied into eating, with de Araujo adding: "The system is not just generalised aggression. It seems to be related to the animal’s interest in obtaining food." So it would appear to be similar to the way alcohol activates the same hunting/eating parts of the human brain. Like the mice, we'd also eat all the biscuits but stop short of having a person.